Note: As Wikipedia classifies the Isle of Man as a "country", Familypedia may as well do the same; so please insert it in the "Nation" field for any event listed on Form:Person. This article is about the island. For the racehorse, see Isle of Man (horse). /ˈmæn/; Manx: Ellan Vannin, pronounced [ˈɛlʲən ˈvanɪn]), otherwise known simply as Mann (Manx: Mannin, IPA: [ˈmanɪn]), is a self-governing British Crown Dependency, located in the Irish Sea between the islands of Great Britain and Ireland, within the British Isles. The head of state is Queen Elizabeth II, who holds the title of Lord of Mann. The Lord of Mann is represented by a Lieutenant Governor. The island is not part of the United Kingdom, but its foreign relations and defence are the responsibility of the UK Government. Although the United Kingdom does not usually interfere in the island's domestic matters, its "good government" is ultimately the responsibility of the Crown (that is, in practice, the Government of the United Kingdom). In the Manx Gaelic language the Isle of Man is known as Ellan Vannin, where ellan is a Manx word meaning island. The earliest form of 'Man' is Manu or Mana giving the genitive name Manann leading to the word Mannin, which is lenited when used after the feminine word ellan, giving Mhannin. As mh is pronounced like a v in Goidelic languages, in modern Manx the name becomes Ellan Vannin. The name is related to the figure of Celtic mythology known as Manannán to the Irish and Manawyddan to the Welsh. The Iron Age marked the beginning of Celtic cultural influence. Large hill forts appeared on hill summits, and smaller promontory forts along the coastal cliffs, while large timber-framed roundhouses were built. It is likely that the first Celtic tribes to inhabit the island were of the Brythonic variety. Around the 5th century AD, cultural influence from Ireland and migration, precipitated a process of Gaelicisation, evidenced by Ogham inscriptions, giving rise to the Manx language, which remains closely related to Irish and Scottish Gaelic. Viking settlement of the Isle of Man began at the end of the 8th century. The Vikings established Tynwald and introduced many land divisions that still exist. The Isle of Man has a temperate climate with cool summers and mild winters. Average rainfall is higher than the average for the British Isles, because of its location at a sufficient distance from Ireland for moisture to be accumulated by the prevailing south-westerly winds. Average rainfall is highest at Snaefell, where it is around 1,900 millimetres (75 in) a year. At lower levels it can be around 800 millimetres (31 in) a year. Temperatures remain fairly cool with the recorded maximum being 28.9 °C (84.0 °F) at Ronaldsway on 12 July 1983. The island's parliament, Tynwald, claims to be the oldest continuously existing ruling body in the world. Tynwald is a bicameral or tricameral legislature, comprising the House of Keys (directly elected by universal suffrage) and the Legislative Council (consisting of indirectly elected and ex-officio members). These two bodies meet together in joint session as Tynwald. Under British law, the Isle of Man is not part of the United Kingdom. However, the UK takes care of its external and defence affairs, and retains paramount power to legislate for the island. There are no independent military forces on the Isle of Man although HMS Ramsey is affiliated with the town of the same name. From 1938 there was a (now disbanded) Manx Regiment of the British Territorial Army, which saw extensive action during the Second World War. There is an independent Isle of Man police force, which is controlled directly by the Isle of Man Government, but which nonetheless voluntarily submits to inspection by the UK inspectorate of police. Citizenship in the Isle of Man is governed by UK law. 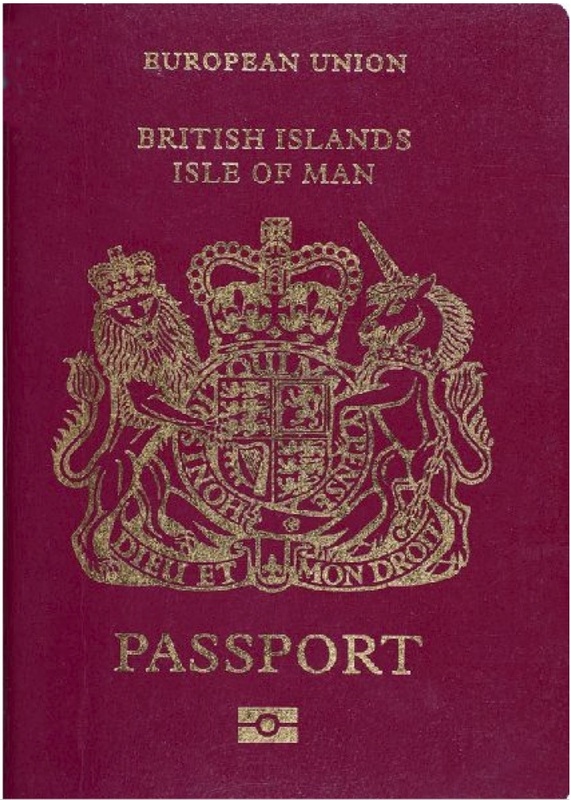 Passports issued by the Isle of Man Passport Office say "British Islands - Isle of Man" on the cover but the nationality status stated on the passport is simply "British Citizen". Although Manx passport holders are British citizens, because the Isle of Man is not part of the European Union, people born on the Island without a parent or grandparent either born or resident for more than five consecutive years in the UK do not have the same rights as other British citizens with regard to employment and establishment in the EU. Isle of Man passports can be issued to any British citizen in the Isle of Man (whether or not that person has "Manx status" as an Isle of Man worker under the local Isle of Man employment laws). They can also be issued to Manx-connected British citizens residing in the UK or either of the other Crown Dependencies. The Isle of Man holds neither membership nor associate membership of the European Union. Protocol 3 of the UK's Act of Accession to the Treaty of Rome permits trade for Manx goods without tariffs. In conjunction with the Customs and Excise agreement with the UK, this facilitates free trade with the UK. While Manx goods can be freely moved within the EU, capital and services cannot be. EU citizens are entitled to travel and reside, but not work, in the island without restriction. And Manx citizens - without the hereditary qualification outlined above - are similarly restricted from working in the EU. 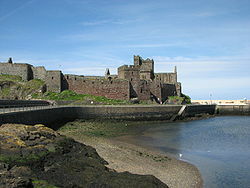 The culture of the Isle of Man is influenced by its Celtic, and to a lesser extent its Norse, origins. Proximity to the UK, popularity as a UK tourist destination, and mass immigration by British migrant workers has meant that British influence has been dominant since the Revestment period. Revival campaigns have attempted to preserve the surviving vestiges of Manx culture after a long period of Anglicisation, and significant interest in the Manx language, history and musical tradition has been the result. In Manx English, the greetings moghrey mie and fastyr mie, which mean good morning and good afternoon respectively, can also be heard. Like Irish and Scottish Gaelic, the English terms evening and afternoon are referred to with one word. Another term used in Manx English is traa dy liooar, meaning time enough, and represents a stereotypical view of the Manx attitude to life. Other Christian churches also operate on the Isle of Man. The second largest denomination is the Methodist Church, which is close in size to the Anglican diocese. There are eight Roman Catholic parish churches, included in the Roman Catholic Archdiocese of Liverpool. Additionally there are five Baptist churches, four Pentecostal churches, the Salvation Army, a ward of the Church of Jesus Christ of Latter-day Saints, a congregation of Jehovah's Witnesses, two United Reformed churches, as well as other Christian churches. There is a small Muslim community, with its own mosque in Douglas, and there is also a small Jewish community. Isle of Man teams and individuals participate in many sports both on and off the island including rugby union, football, gymnastics, field hockey, netball, Taekwondo, bowling and cricket. It being an island, many types of watersports are also popular with residents. Prior to the introduction of football at the turn of the twentieth century, Cammag was the national sport of the Isle of Man. It is similar to the Irish hurling, and the Scottish game of shinty. Nowadays it is an annual match at St John's. ^ "Income inequalities". The Poverty Site. http://www.poverty.org.uk/09/. Retrieved 21 April 2011. 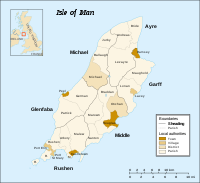 ^ Ellan is Manx for "island"; Vannin is the genitive case of Mannin, and means "of Mann". ^ Constitution: The term "good government" is used in the "Kilbrandon Report" of the Royal Commission on the Constitution. According to the House of Commons Justice Committee, there is "a high degree of consensus amongst academics, legal advisors, politicians and officials about the meaning of the term 'good government' used in the Kilbrandon Report. They agree that good government would only be called into question in the most serious of circumstances [...]", such as "a fundamental breakdown in public order or endemic corruption in the government, legislature or judiciary. [...] Kilbrandon suggests that intervention to preserve law and order or in the event of grave internal disruption would be justifiable, but that an attempt to define the circumstances further would be essentially pointless." Source: Report retrieved 15 July 2010. ^ (1979) "The Place Names of Roman Britain": 410–411. ^ Koch, John (2009). Tartessian: Celtic from the Southwest at the Dawn of History in Acta Palaeohispanica X Palaeohispanica 9. Palaeohispanica. pp. 339–351. ISSN 1578-5386. http://ifc.dpz.es/recursos/publicaciones/29/54/26koch.pdf. Retrieved 17 May 2010. ^ "Rethinking the Bronze Age and the Arrival of Indo-European in Atlantic Europe". University of Wales Centre for Advanced Welsh and Celtic Studies and Institute of Archaeology, University of Oxford. http://www.wales.ac.uk/Resources/Documents/Centre/RethinkingtheBronzeAge.pdf. Retrieved 24 May 2010. ^ "Snaefell Mountain Railway". Isle of Man Guide. Maxima Systems Ltd. http://www.iomguide.com/mountainrailway.php. Retrieved 5 June 2008. "From the top on a clear day it is said one can see the six kingdoms. The kingdom of Scotland, England, Wales, Ireland, Mann and Heaven." ^ "Snaefell Mountain Railway". visitisleofman.com. Isle of Man Government. http://www.gov.im/tourism/culture/attractions/snaefell_attract.xml. Retrieved 5 June 2008. ^ "Snaefell Mountain Railway". Best Loved Hotels. http://www.bestloved.com/attractions/snaefell-mountain-railway-in-douglas-isle-of-man-the-north-england-uk.php. Retrieved 5 June 2008. ^ "Snaefell Summit". isle-of-man.com. http://www.isle-of-man.com/manxnotebook/tourism/pcards/snaefell.htm. Retrieved 5 June 2008. "It is the answer to the often posed question as to where can one see seven kingdoms at the same time? The seven Kingdoms being the four mentioned by Earl James, the Kingdom of Man, of Earth (in some answers that of Neptune) and of Heaven." ^ "Isle of Man Census 2006 - Summary Results" (PDF). Isle of Man Treasury. Isle of Man Government. December 2006. http://www.gov.im/lib/docs/treasury/economic/census/isleofmancensusreport2006.pdf. Retrieved 5 June 2008. ^ "Monthly Averages for Douglas, Isle of Man (14424)". The Weather Channel. http://www.weather.com/outlook/health/fitness/wxclimatology/monthly/IMXX0002. Retrieved 18 April 2012. ^ ﻿Royal Commission on the Constitution 1969 - 1973, Volume I, Report (Cmnd 5460)﻿ (Report). London. 1973. ^ "Isle of Man Facts & Economic Data". Isle of Man Finance. Isle of Man Government. http://www.gov.im/iomfinance/media/facts.xml. Retrieved 12 September 2010. ^ "Immigration in the Isle of Man". Isle of Man Government. October 2006. p. 12. http://www.gov.im/lib/docs/cso/immigrationintheisleofmanpub.pdf. Retrieved 12 September 2010. ^ "Isle of Man Newspapers". Isle of Man Newspapers. Archived from the original on 22 August 2008. http://web.archive.org/web/20080822194758/http://www.iomtoday.co.im/newspaper.aspx. Retrieved 4 September 2008. ^ "Driving on the Isle of Man". Isle of Man Guide. Maxima Systems Ltd. 2005. http://www.iomguide.com/drivingontheisleofman.php. Retrieved 8 June 2010. ^ "UNESCO accepts Manx language is not 'extinct'". Isle of Man Government. 19 August 2009. http://www.gov.im/lib/news/cso/unescoacceptsman.xml. Retrieved 20 August 2009. ^ Davies, Alan (2007). An Introduction to Applied Linguistics (2nd The Manx ed.). Edinburgh: Edinburgh University Press. ISBN 978-0-7486-3354-8. ^ Arthur William, Moore (1971). The Folk-Lore of the Isle of Man (Reprint ed.). Forgotten Books. pp. 274. ISBN 1-60506-183-2. ^ "The Three Legs of Man". (www.isle-of-man.com). http://www.isle-of-man.com/manxnotebook/history/legs.htm. Retrieved 15 September 2011 . This webpage cited: Wagner, A.R. (1959–60). "The Origin of the Arms of Man". Manx Museum 6. . This webpage also cited: Megaw, B.R.S. (1959–60). "The Ship Seals of the Kings of Man". Manx Museum 6. ^ Many religious organisations on the island are listed on the Isle of Man government site "Religious Faiths and Organisations". ^ "The Game of Cammag". http://www.celticlife.ca/index.php/Sports/the-game-of-cammag.html. Retrieved 12 September 2011. This page uses content from the English language Wikipedia. The original content was at Isle of Man. The list of authors can be seen in the page history. As with this Familypedia wiki, the content of Wikipedia is available under the Creative Commons License.